Toronto residents Matthew A. Tavares, Chester Hansen and Alex Sowinski first met in Humber College’s Music Performance program, bonding over a common love for Odd Future, Gucci Mane and Lil B. They began jamming casually and the Odd Trio was assembled. Matthew A. Tavares on piano and synths, and bassist Chester Hansen and Alex Sowinski on skins. Tavares and Sowinski also do double duty on sampler for instrumental beat freakouts in their live shows. [toggle_box title=”Bio” width=”Width of toggle box”]The first Odd Trio video became a viral sensation and they began to cultivate a devoted fanbase through YouTube, Twitter, and Tumblr. 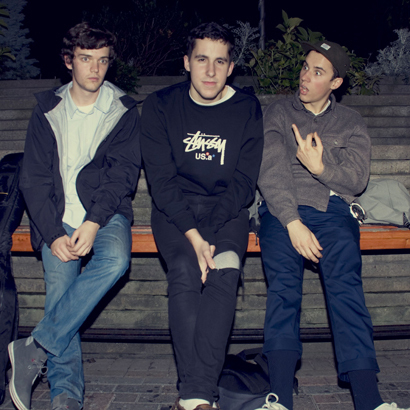 The trio dropped the new videos on the regular and millions of hits later, the newly recristened Badbadnotgood released their self-titled EP in June. The Badbadnotgood EP mixed up the two Odd Future medleys, the original “Salmonella” and an inspired cover of Waka Flocka Flame’s “Hard In The Paint”; Tavares subs keys for Lex Luger’s menacing synths while Sowinski becomes a human drum machine. Hansen shines whether supplying the pumping bass of “Orange Juice” or effortless in-pocket swing of “Electric Relaxation”. Inspired equally by Lil B, Waka Flocka Flame, John Coltrane and Robert Glasper, Badbadnotgood find the post-bop in Big Apple classics (Nas’ “The World Is Yours”, Gang Starr’s “Mass Appeal”, Tribe’s “Electric Relaxation”), Zelda themes and the off-kilter electronic of Flying Lotus (“Camel”). These are hip hop standards but they aren’t sacred.” “Mass Appeal” bleeds into a throbbing run through Joy Division’s “Transmission”. On “Electric Relaxation”, Sowinski swaps drums for a half-empty 40 oz, the Olde English falling perfectly in pitch. They were strictly a studio creation until mid September, where BBNG sold out their debut show at Toronto’s Red Light Club; that same day, the band dropped their debut full length BBNG on Bandcamp, mixing more rap covers (including a warm, swaying take on Slum Village’s “Fall In Love”) with Zelda covers and a host of originals, including Sowinski’s ominous sampler workout “Freedom/Billium Evans”. The Needle Drop’s Anthony Fantano was effusive in his praise for the album: “I’m excited about what this LP means for jazz, what it means for hip hop, and what it means for music fans”. Coming off a high profile spot opening for jazz legend Roy Ayers in November, the band are prepping for a big 2012: next January, BBNG played Gilles Peterson’s Worldwide Awards show in London, alongside Thundercat and SBTRK. Besides their next mixtape, the trio are also working with Toronto producer Frank Dukes (50 Cent, Danny Brown, Ghostface Killah) and set to record more tracks with Odd Future in the coming months.